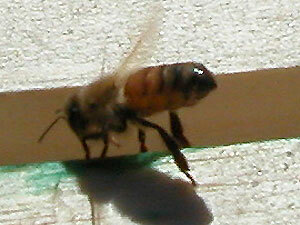 The most important thing we wanted to learn today was whether the new Queen we introduced on Thursday was accepted. Here are two absolutely textbook pictures of a queen moving around her colony with the retinue of workers who take care of her! In other words, yes she is home. 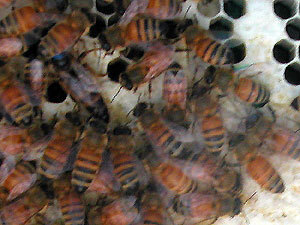 On the left you can see the queen with her blue dot partially obscured: queens try to flee the light, and blue is the color code for queens added in 2005. On the right, you can see a classic circle of attendant workers around the queen: they are there to groom her, bring her food and water, and to spread her scent around the colony. Sorry for the problem focus: gotta find a way to work through my veil. There wasn't much new comb yet in the nuc from which we are re-birthing Colony 1: that may be why the queen was working a pretty full frame. 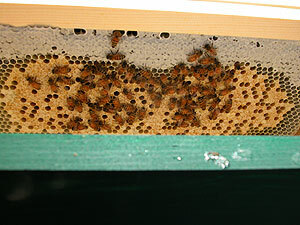 On the left is an even fuller frame of capped brood from the nuc. 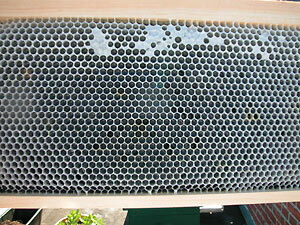 On the right is a frame full of nectar that I looked at carefully for eggs. 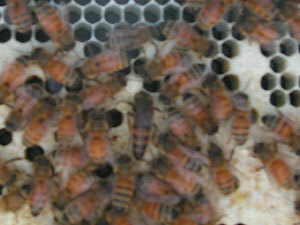 I did not see any, and you can see that the girls are beginning to cap these cells. That will result in honey to be used for future needs. This worker is raising her Nasanoff gland to emit a smell that says: "This is home!" She is sitting on top of the laying worker part of Colony 1, so I found this awfully encouraging. 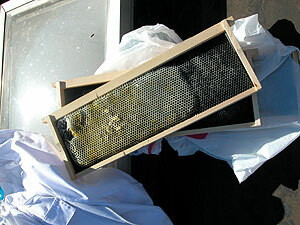 On the right is some of the ugly drone comb that was reintroduced into the nuc so that the bees can clean it a bit and reuse it. The dead larva bits look nasty, so I am going to query whether I should clean or toss this frame instead. When we worked on Colony 2, we had to cut a bunch of comb in order to bring the frames back into proper alignment. 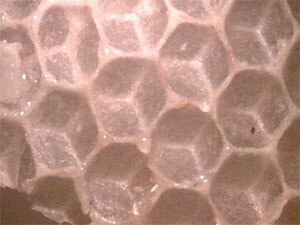 This is a closeup picture of some of the honeycomb, taken with a kid's digital microscope by my husband. Those little drops are honey! We tasted some, and swear it tastes like holly flowers. On the right is a now-united Colony 1, with the perforated newsprint hanging out so you can see it. 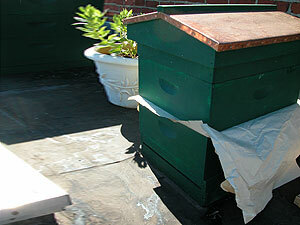 The excess was torn off to prevent flapping in the wind: a hazard and annoyance to the field bees flying in and out.